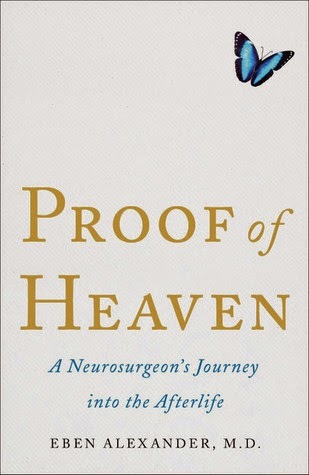 Out of curiosity I wanted to read Eben Alexander's Proof of Heaven. It's a neurosurgeon's story of his Near Death Experience. It does make a different story when NDE happens to someone who works with brains daily and doesn't really believe in God. Religion as such has gone out fashion. It's more trendy to not to believe in any higher forces. Also it's much easier to explain that God doesn't exist, than try to believe that it does. No one knows for sure to way or another, so I'll leave the subject out of the review totally. I'll just concentrate to the book itself. Subject interested me a lot. I was excited to hear the story, what happened and how the situation actually happened. After all it was a neurosurgeon who faced the situation, so I was expecting a quite detailed and well organized package. I have to say I was disappointed. Book wasn't well written and it was even hard to follow sometimes. It would have used a proper editor to structure the book better. Book jumped between real life and the life Eben Alexander was facing too much. I don't know what was the logic behind the books structure, but I at least didn't like it. I did get interested about NDE's as such. Without going too much into why the NDE's happens, it is interesting to hear and understand what goes in minds of those who are dying. We all are going to die and most probably we will face something similar on that moment. I don't really recommend the book. It is an interesting book, but I would have liked bit different approach to the storytelling. I'm still glad I read the book. I want to keep my mind open and this was one subject I hadn't touched before. I might even read another NDE book some day.